For more than 12 years, it was an uphill struggle for Eugenia Kleinpeter to locate mental health services for her children. Her eldest son, Greg—like four of his younger siblings—has special needs and spent time in the foster care system. Like many in the African American community, and particularly in rural areas, Eugenia is actively involved in her church as an Assistant Minister and Sunday School teacher. 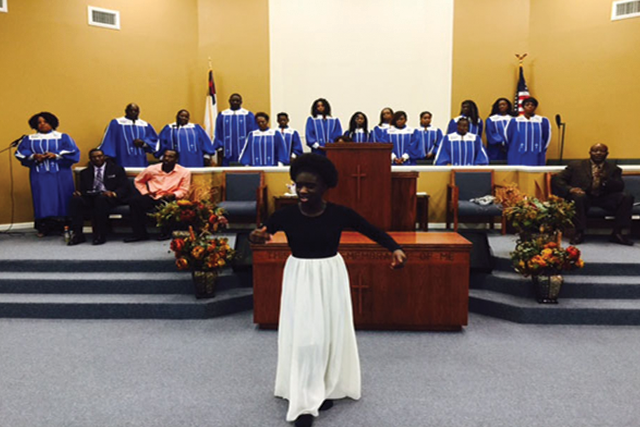 Her church, God’s Way Christian Baptist Church, is one of 11 faith-based organizations in African American communities that received funding through the Hogg Foundation’s Faith-Based Initiative for African American Mental Health Education. The initiative aims to capitalize on the unique role that churches and other faith-based organizations play in African American communities, and to use these organizations as conduits for mental health education and awareness. First launched in 2014 with $947,000 in grants distributed over three years, in 2017, the foundation added an additional year of funding, totaling $350,000, with a new focus on addressing the mental health impacts of Hurricane Harvey and other disasters. God’s Way is based in Taylor, Texas and is led by Reverend Dr. B.R. Reese. The church used its grant funds to create a program called Wellness and Empowerment Community Ministries (WECM), which offers church members a range of programs that help address psychological and spiritual needs. The God’s Way approach mirrors that of the other faith-based grantees. What they each have in common is years of involvement and earned credibility in the eyes of the people they serve, an ability to serve as a connector between congregants and available mental health services, and a willingness to innovate new programs and approaches where they don’t currently exist. For faith leaders and faith communities, involvement with the foundation is mutually beneficially. They are making strides in their ability to support individuals who have mental health needs, and openly acknowledge that certain traditional responses, such as the advice to “just pray it away,” spread misconceptions around mental health and further stigmatize those who need adequate mental health services and supports. The faith-based initiative is part of the foundation’s larger effort to build upon existing community strengths to enhance overall well-being. It also leverages the evidence base we have about how to do more than just infuse dollars, but to foster relationships that live beyond the grant term.